In 1982/3 the chance of an 18 month old Saab Turbo came along, so it was out with the sturdy old Volvo, and in with this (for its day) super-quick 5 door family hatchback. A very early (LHD) car, OND 411W was a German market car, that had been imported into the UK by its company car driver. I was beginning secondary school when dad bought this car, and it put me in good stead for the usual classroom arguments about who's dad had the quickest car. 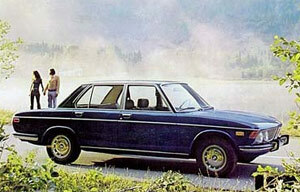 Someone I knew had a Datsun Sunny as their family car, which caused a lot of mirth amongst the junior motoring fans, and another pal's dad had a early 1970s BMW 3.0S (ex- Francis Chichester I think). This Beemer was a rapid machine, but little consideration was given to it's mechanical or bodily welfare, so it fell into shabbiness after a few years. A couple of hubcaps from that old Beemer hang up in my garage to this day. 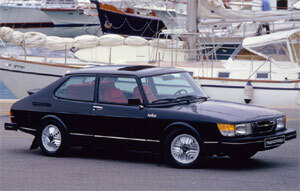 Often we'd have heated debates about which car, the Saab or the Bimmer, was quickest. In truth, the Saab was probably quicker accelerating, but the BM probably had a slight edge at the top end, despite being a fair bit older and saddled with an auto 'box. The Saab was one of the first cars I drove (off the road naturally..), one time I gave it some stick around a field down in Bognor, which was highly entertaining. The Saab stayed in the family for a number of years, although the body soon started to go a bit scabby, its water-based metallic paint not being terribly resilient. It soon started to corrode around the edges of the sunroof, and, worst of all, all around the rear tailgate. Dad would often touch up the paintwork to improve things, but we'd still pull his leg about the final paint 'finish', and the Hammerite that was regularly re-applied to the panel between the rear lights. One day, on a trip down to Bognor (to visit my Gran who lived there), we clobbered a Pheasant at approx 70mph. It made a hell of a bang, but fortunately didn't damage the car too much, just bending a fog lamp bracket, and fortunately missing the oil cooler beneath the front bumper grille. The bird wasn't so fortunate and was definitely going nowhere after that impact. The Saab stayed with us for a good number of years, only being replaced in the late 80s when dad fell for a Series 3 XJ6, reg ANE 100Y in Rhodium Silver. By this time I was a driver myself, initially in the A40, and then the MkIII Spitfire that I resurrected from a stash of dismembered parts. 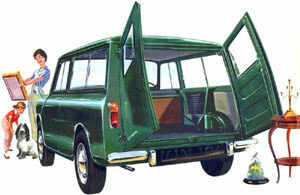 I learnt to drive proper in mum's tweaked Mini estate (all steel, no wood), dating to 1967ish - GVU 146E I think the reg. was. At the time, c1986/7, my bro used to go for cricket lessons at a nearby cricket club in Cheadle Hulme, so we'd pile in the Mini and take him up there for his lessons. I'd then get chance to have a go in the Minbin, haring around some unused land near the entrance to the club. I think I must have learnt something whilst caning the Mini around, usually leaving a nice layer of mud up the sides of the car in the process. When it came time to actually take my test, mum had just taken ownership of the A40 that I mentioned earlier, so it was in this car that I ended up taking my test. The driving test man looking slightly uneasy at the prospect of conducting the test in a car without seatbelts, but he bravely got in nonetheless. Fortunately things went to plan, and I passed. From then on I was mobile in my own right, which was a great feeling. Previously I'd been a fairly keen cyclist, but since passing my test I've probably sat on a bicycle saddle only a handful of times. Perhaps it is time to dust off my pedal cycle and re-discover my long-lost fitness, but somehow I doubt it will happen anytime soon.